IMPORTANT: Before running Instant-RSVP, you must edit Instant-RSVP.exe.config in Windows Notepad or any text editor. Your SMTP email credentials must be correctly entered inside that file. For non-techies, this really just means to enter your gmail username and password. For techies, you can use any SMTP system you want as long as you can connect and authenticate. 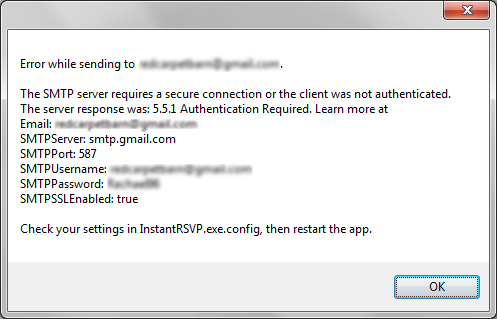 Your SMTP email credentials must be correctly configured inside Instant-RSVP.exe.config. You can edit this file with windows Notepad or any text editor. This file comes pre-configured for Gmail, but you will need to enter your Gmail email address in the SMTPUsername setting and your Gmail password in the SMTPPassword setting. Obviously you must also be connected to the Internet. If you're running this app inside a corporate firewall, make sure your company isn't blocking port 587--that's the SMTP port that Gmail uses. Running this from home should always work as long as you have a stable Internet connection. Ensure your credentials are exactly correct (password is case sensitive) in the Instant-RSVP.exe.config file, and that you entered your email address in the SystemEmailFrom setting. Note: There is nothing insecure about Instant-RSVP, but google brands any app "insecure" that wasn't made by them or a major software company. We have found that google does sometimes block Instant-RSVP until this settings is changed. After logging into gmail from a browser, visit the Recently Used Devices page. If a device is being blocked that appears to be the PC or Windows tablet from which you're trying to use Instant-RSVP, unblock that device. Q. How is the app installed? A. Simply download the zip file and extract to any folder on your PC. Double-click Instant-RSVP.exe to run it. Q. Does Instant-RSVP contain any malware, adware, spyware, etc? A. Absolutely not. We hate that garbage as much as you do. This app is 100% clean, lean, and lightweight. If you want to remove it from your PC, simply delete the 2 files that came in the zip. Q. Is other software required for this to work? A. Yes, Microsoft .NET 4.0 or later. You might have it already. If not, download it free. Q. How can I tell if .NET 4.0 or later is installed on my PC? A. Try to launch the app by double-clicking Instant-RSVP.exe, which comes in the zip download. If nasty error messages immediately occur, and the app won't open, you'll need to download and install .NET 4.0 or later. Q. When I double-click Instant-RSVP.exe I get error messages and the app doesn't open. What's wrong? A. You need to download and install Microsoft .NET 4.0 or later. It is free. Q. Why is a software install required? Why not just make it web-based? A. The original plan was to make this a pure web-based system, but that became impractical. If large amounts of email traffic started to originate from our server, we would get blacklisted and our users would suffer. Because the app is downloaded, your email invitations originate from your PC and this avoids spam flags and email blacklisting. Consequently you will enjoy a trouble-free experience with Instant-RSVP. Q. Can I run the app on more than 1 PC? A. Yes, it's unlimited and free. Q. Will the app run on a Mac? Q. Will the app run on iPhone or Android? A. Not yet. Stay tuned. Q. Will the app run on tablets? A. It should run on any Microsoft Windows tablet. Q. What is iFrame URL for on the downloaded app?